Phagocytosis, or “cell eating”, is the process by which a cell engulfs a particle and digests it. The word phagocytosis comes from the Greek phago-, meaning “devouring”, and -cyte, meaning “cell”. 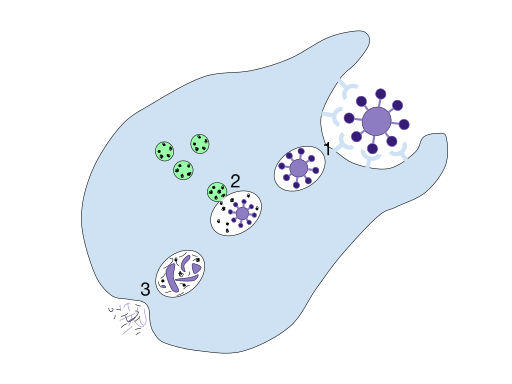 Cells in the immune systems of organisms use phagocytosis to devour bodily intruders such as bacteria, and they also engulf and get rid of cell debris. Some single-celled organisms like amoebas use phagocytosis in order to eat and acquire nutrients. The function of phagocytosis is to ingest solid particles into the cell. Phagocytosis is a type of endocytosis, which is when cells ingest molecules via active transport as opposed to molecules passively diffusing through a cell membrane. Only certain small molecules can pass through the cell membrane easily; larger ones have to go through special channels in the cell or be ingested via endocytosis. Other types of endocytosis include pinocytosis, also called “cell drinking”, and receptor-mediated endocytosis, which is when molecules bind to specific receptors on the cell membrane that causes the cell to engulf them. Phagocytosis is different from pinocytosis because phagocytosis involves the ingestion of solid particles while pinocytosis is the ingestion of liquid droplets. Phagocytosis is also used by cells to take in much larger particles than those that are ingested through pinocytosis. Some single-celled protists, such as amoebae, use phagocytosis to ingest food particles; it is literally how they eat food. Since their entire body consists of one cell, they can ingest food particles through engulfing them, and then digest these particles by connecting with a lysosome. In pinocytosis, the particles that are engulfed do not need to be broken down by a lysosome because they are so small, and instead the vesicle empties its contents directly into the cell. The cell that will perform phagocytosis is activated. This can be a phagocyte, which is a cell in the immune system that performs phagocytosis, or an organism such as an amoeba, which behaves in a similar way to phagocytes when it carries out phagocytosis. In the case of immune cells, activation occurs when the cells are near bacterial cells or parts of bacterial cells. Receptors on the surface of the cells bind to these molecules and cause the cells to respond. In the immune system, chemotaxis may occur. Chemotaxis is the movement of phagocytes toward a concentration of molecules. Immune cells pick up chemical signals and migrate toward invading bacteria or damaged cells. The cell attaches to the particle that it will ingest. Attachment is necessary for ingestion to occur. Some bacteria can resist attachment, making it harder for them to be taken into the cell and destroyed. The cell ingests the particle, and the particle is enclosed in a vesicle (a sphere of cell membrane with fluid in it) called a phagosome. The phagosome transports the particle into the cell. A lysosome fuses with the phagosome and the particle is digested. Lysosomes are vesicles that contain hydrolytic enzymes that break down molecules. A phagosome fused with a lysosome is called a phagolysosome. Cellular waste, such as broken down molecules that the cell cannot reuse, is discharged from the cell by the process of exocytosis. Exocytosis is the opposite of endocytosis; it is when cellular waste products travel in vesicles to the surface of the cell membrane and are released, thereby exiting the cell. This diagram shows the process of phagocytosis. A cell ingests a particle, breaks it down with the enzymes in lysosomes, and expels waste products through exocytosis. Phagocytes are found throughout the human body as white blood cells in the blood. One liter of blood contains approximately six billion of them! Many different types of white blood cells are phagocytes, including macrophages, neutrophils, dendritic cells, and mast cells. White blood cells are known as “professional” phagocytes because their role in the body is to find and engulf invading bacteria. “Non-professional” phagocytes include other types of cells like epithelial cells, endothelial cells, and fibroblasts. These cells sometimes perform phagocytosis, but it is not their primary function. As mentioned earlier in the article, amoebae perform phagocytosis in order to consume food particles. Amoebae engulf particles by surrounding them with pseudopods, which are temporary armlike projections of the cell that are filled with cytoplasm. Ciliates are another type of organisms that use phagocytosis to eat. Ciliates are protozoans that are found in water, and they eat bacteria and algae. Both amoebae and ciliates are protists, organisms that have eukaryotic cells but are not animals, plants, or fungi. Protist – An organism with eukaryotic cells that is not an animal, plant, or fungus; they are grouped together for convenience but not all are closely related. Endocytosis – The process by which cells ingest molecules through active transport as opposed to passive diffusion. Pinocytosis – The process by which a cell engulfs liquid droplets containing small particles. Phagocyte – An immune cell that gets rid of foreign material by ingesting it through phagocytosis. 1. What is the function of phagocytosis? D is correct. All of these are functions of phagocytosis, although they are performed by different cells. Choice A is performed by phagocytes in the immune system, B can be performed by phagocytes or other cells like endothelial cells, and choice C describes certain protists. A is correct. Endocytosis includes phagocytosis, pinocytosis, and receptor-mediated endocytosis, among other processes. Choice B specifically describes pinocytosis only, choice C is exocytosis, and choice D is digestion in lysosomes (which is a step in endocytosis). 3. Which of the following does NOT enter a cell through phagocytosis? B is correct. Oxygen is a small molecule and it can easily diffuse through the cell membrane, which is important because animal cells need oxygen to survive and carry out cell processes. Larger molecules or even whole organisms like bacteria and algae are taken into a cell via phagocytosis. They are too large to simply pass through the cell membrane unaided.